At 9:30 p.m. Monday, Eugene Tangney burst into a meeting of doctors at the command center for Long Island’s North Shore-LIJ hospital system. Ceiling tiles creaked in the wind and television screens showed images of Hurricane Sandy slamming into New York City. Tangney, a senior vice president, already had plenty to worry about — 16 North Shore-LIJ hospitals spread across New York and Long Island. 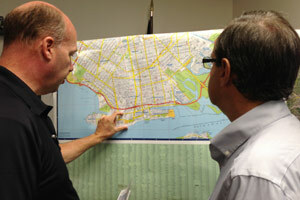 Minutes later, a member of the team delivered an alarming report about a community hospital in Bay Shore, N.Y. Hours earlier, corporate leaders had called Southside and Staten Island University Hospitals to go over how they would handle the worst-case scenarios: Had they thought about what they would do if backup systems failed and part or all of their facilities suddenly lost power? Everyone on the call understood what this meant. Modern medicine depends on electricity, from the ventilators that keep seriously ill patients breathing to the monitors that detect life-threatening changes in vital signs. Now, in the late evening hours, the worst-case scenario was unfolding at the main campus of NYU’s Langone Medical Center in Manhattan, which had lost much of its backup power at the height of the storm. Could North Shore-LIJ dispatch ambulances from its Lenox Hill Hospital in New York City to pick up four critically ill babies from the neo-natal intensive care unit? But anyone following the recent history of how hospitals and nursing homes have fared in American disasters had ample reason for concern. In many New Orleans hospitals after Hurricane Katrina in 2005, floodwaters knocked out vulnerable backup power systems. A day later, still awaiting rescue in intense summer heat, doctors at Memorial Medical Center were so desperate, they intentionally hastened the deaths of some patients by injecting them with morphine and sedatives, and ultimately 45 bodies were found at the hospital. Over the past five years, I’ve reported on the impact of disasters on hospitals and medical systems, from Hurricanes Katrina, Gustav and Isaac in New Orleans to Hurricane Irene in New York. I’m also writing a book about this subject. So when Hurricane Sandy approached, I interviewed city and state health and emergency commissioners about their plans and the reasons for their decision this time not to mandate hospital and nursing home evacuations in the city’s most vulnerable areas. I pressed them on this even though there was every indication they and their staffs had diligently prepared for the storm. Last year, these commissioners decided that many of the same hospitals and nursing homes should be evacuated before Hurricane Irene, many of them shutting their doors for the first time in history in part due to the lessons of Katrina. In interviews, they told me that the decision to evacuate last year was based on fears that an eight-foot storm surge could knock out backup power. Even after Irene proved less damaging than expected in New York City, they stood by their decision to shift thousands of patients to safer locations. It was much better, they said, to move patients in a controlled, calm environment with full power than it would be to empty hospitals in the midst of an emergency. 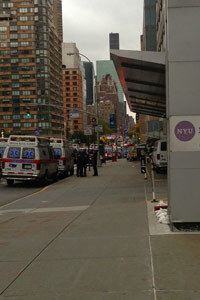 As Irene approached, NYU Langone Medical Center transferred or discharged all but a few very critically ill patients. It kept a full complement of staff on duty to care for them and respond to storm-related emergencies. Coney Island Hospital was also fully evacuated before Irene. Many of its staff members and doctors traveled with their patients to other hospitals, including sections of Long Island College Hospital and Maimonides Medical Center in Brooklyn. This time around, the commissioners decided not to order as many evacuations, an approach that puzzled me since the weather service was predicting as early as Sunday morning that the storm surge could reach 11 feet in lower Manhattan and, as early as Saturday morning, up to eight feet from Ocean City, Md., to the Connecticut-Rhode Island border. What had changed in the intervening year? Were the hospitals and nursing homes better prepared to handle a hurricane? Were the lessons from other recent disasters being applied to a storm being described as the worst in a century? I rented a car and drove to the Long Island command center in hope of finding out. The answers I came away with after reporting from crippled hospitals in Manhattan and Coney Island and darkened, sand-swept nursing homes by the ocean in the Rockaways highlight the complexities of that decision and raise some serious questions. There was a clear payoff from recent efforts to improve preparedness. No one at a hospital had died in a storm-related incident as of Thursday morning, according to New York state health commissioner Dr. Nirav R. Shah. Shah said he had heard of only one injury, a single fractured limb he understood was due to a fall caused by slipping on a wet floor. Still, even though the larger health care community averted an immediate catastrophe, the question remains: After everything we’ve learned about those horrific days in New Orleans, how could another hospital in a major American city find itself without power, its staff fighting to keep alive their most desperately sick patients? On Wednesday evening at 5 p.m., there were still a few patients to transfer from Coney Island Hospital and four nursing homes in Brooklyn and the Rockaways, according to the New York State Department of Health. In several of these places, backup power systems were inadequate for prolonged use or nonfunctioning, and city power had not been restored. The long-term health effects on vulnerable patients like these might not be immediately calculable. Please continue to read full article on ProPublica. Post and images used with permission from ProPublica.